Model SNS1P6U Ultimate Connectors, the newest addition to the Snap N Seal system. 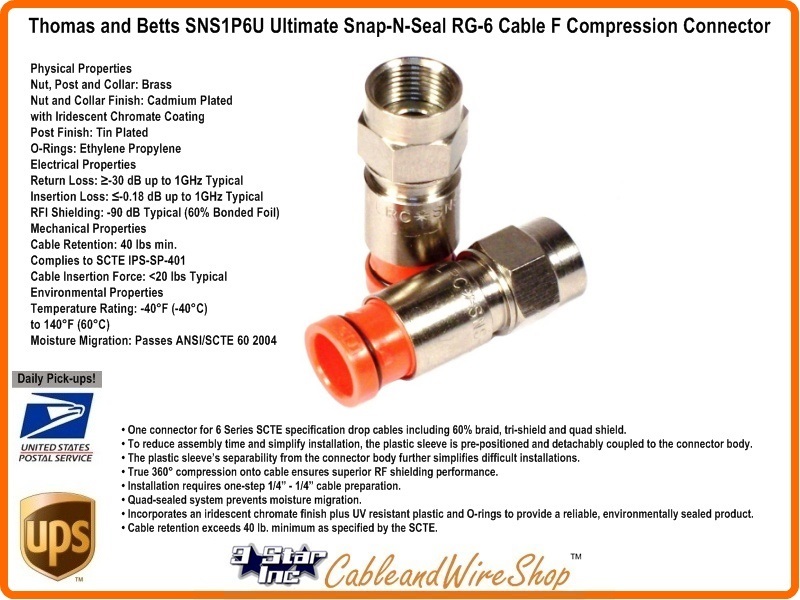 With its usefriendly, pre-positioned and detachably coupled plastic sleeve, the Ultimate Snap N Seal Connector incorporates time-proven for a reliable connection! Now you can use the same connector for 6 Series SCTE specification drop cables including 60% braid, tri-shield andQuad Shield. To reduce assembly time and simplify installation, the plastic sleeve is pre-positioned and detachably coupled to the connector body. The plastic sleeve's separability from the connector body further simplifies difficult installations. The Connector of choice for Advanced Broadband Communication and Satellite companies such as Comcast, Charter, EchoStar (DISH Network), DirecTV and Time Warner. -Bag of 50. Cable Retention: 40 lbs min. Look for the classic design of this Thomas & Betts connector. With its usefriendly, pre-positioned and detachably coupled plastic sleeve, the UltimateTM Snap N Seal Connector incorporates time-proven advantages for a reliable connection. The plastic sleeve fts separability from the connector body further simplifies difficult installations.